• Citizens National Bank announces that Mark Montgomery has been named chairman of the bank’s board of directors. Mr. Montgomery is a charter board member of Citizens National Bank and has been a realtor, real estate appraiser and community leader for over 47 years. A lifelong Bossier Parish resident, he is a past chairman and commissioner of the Bossier City Metropolitan Planning Commission, past chairman and board member of the Better Business Bureau of North Louisiana and past member of Bossier Parish Police Jury. He has also served as president of the Bossier City Rotary Club. He holds degrees in business administration, economics and history from Northwestern State University and is a Bossier High School alum. “We are thrilled to announce Mark Montgomery as our new chairman of the board. As one of our founding directors, Mark has a strong sense of who we are as a bank and the important role we play in the community. He shares our passionate goal of being ‘the’ community bank of North Louisiana for many years to come,” said Jason D. Smith, Citizens National Bank president and CEO. Chartered in 1985, Citizens National Bank is a community bank operating in the Bossier City and Shreveport as well as Claiborne, DeSoto and Webster parishes. Citizens National Bank offers a variety of banking products and services for both personal and business needs. The Red River Waterway Commission announces the appointment by Gov. John Bel Edwards of a new commissioner, Mr. Roy A. Burrell. He will serve as one of four at-large members of the Commission. A native of Northwest Louisiana, Burrell built his career in the engineering field working as a facility and planning engineer for BellSouth Telecommunications. He also has an extensive 20-year (1996-2016) background in public service – eight years as a Shreveport City Councilman, and 12 years as a Louisiana state representative serving three consecutive four-year terms. He is also a former radio talk show host and past columnist for The Shreveport Sun newspaper. His passion for change in public policy that affects community and economic development issues has led him to sponsor important legislation to fund transportation infrastructure economic impact studies for interstate and railway transportation, such as the Inner City I-49 Corridor and Amtrak passenger rail service. His recent interest in waterway commerce and transportation should prove beneficial to the region and the state of Louisiana. Adkins Seale Capital Management team welcomes a new LLC member, Jay K. Binderim, CFA. Binderim brings 10 years of diversified experience in portfolio management and credit analysis to the organization. The company’s primary mission is providing investment advisory services to individuals, institutions and business entities. Jay earned the Chartered Financial Analyst designation in 2014. With this addition to the LLC membership, the firm is uniquely positioned with all three principals holding the CFA designation. Over the previous five years, Binderim has worked as a portfolio manager at Regions Bank. His previous work experience also includes positions with CenterPoint Energy and Ouachita Independent Bank. He holds a business degree from Centenary College and a master’s degree from LSU-S.
For more information on Adkins Seale Capital Management, call (318) 703-3641 or e-mail lisajohnson@ascm-llc.com. BOM, a leader in banking services for northwest and central Louisiana, has hired Barry Milligan as vice president and commercial lender for the Shreveport market. He will work in the BOM branch at 4321 Youree Drive. A veteran of the banking industry, Milligan has nearly 30 years’ experience in a variety of positions, including branch management, investments, insurance solutions and customer relationships, among numerous others. He also serves as an adjunct professor for the Northwestern State University College of Business and teaches financial literacy classes through United Way and The LightHouse program offered through Volunteers of America. Milligan earned a bachelor’s degree in business management from Southeastern Louisiana University in Hammond and an executive MBA degree from Centenary College. Previously, he served as vice president and commercial lender for Home Federal Bank. A graduate of Captain Shreve High School, Milligan also serves as a board member for several organizations: Southern Trace Country Club board of governors; Southern Hills Business Association; and president of the St. Charles Place Homeowners Association. The American Kitefliers Association will hold its 41st Annual Convention in Shreveport, Oct. 15-20, 2018, with approximately 200 association members attending. 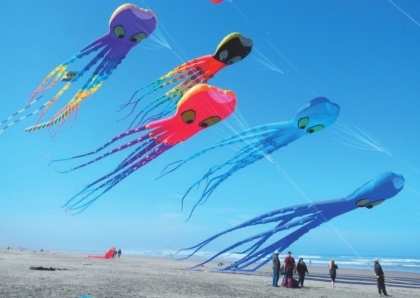 Outdoor kite flying will take place on the soccer fields at Louisiana State University Shreveport, while indoor flying will be done at the Shreveport Convention Center. The public is invited to bring kites to fly at LSUS and watch indoor flying at the Shreveport Convention Center. In addition, the Kitefliers Association is passionate about community involvement and is planning to perform demonstrations for children at local hospitals and schools. Kevin Flowers, convention sales manager at the Shreveport- Bossier Convention and Tourist Bureau, worked with the local hospitality community and LSUS to win the bid. This will be the organization’s first time to host a convention in Louisiana. The estimated economic impact of the event is $197,500. To learn more about the Kitefliers Association, please visit www.kite.org. The Cyber Innovation Center (CIC), headquartered in Bossier City, received a $4 million continuation grant from the United States Department of Homeland Security (DHS). The CIC is the anchor of the 3,000-acre National Cyber Research Park and serves as the catalyst for the development and expansion of a knowledge-based workforce throughout the region. 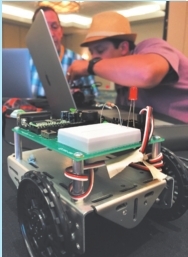 The fiscal year 2017 DHS grant supports the CIC’s continued nationwide expansion of its K-12 education and training program designed to provide educators with curricula, resources and dynamic professional development in science, technology, engineering, mathematics (STEM), cyber and computer science. CIC’s curricula, such as STEM: Explore, Discover, Apply (STEM EDA), Cyber Literacy, Cyber Science and Computer Science, provide students the academic fundamentals and cyber degree/career awareness needed to significantly expand the number of cybersecurity professionals entering the U.S. workforce. Though the CIC’s educational programs span across the country, local school districts like Bossier Parish School Board continue to benefit from this valuable work. “We are proud of our partnership with the Cyber Innovation Center and its innovative approach to connecting our students to real-world applications in cyber as well as cutting-edge degree and career opportunities,” says Mr. Scott Smith, superintendent of Bossier Parish Schools.